Fermenting… most people either love it, are curious, or are cautious skeptics. When trying something new out of my normal food experience I am very cautious. I worry about two things; I don’t want to waste ingredients and I don’t want to taste something that grosses me out. So, Inspiration does not always come easy. It took me years to be brave enough to canning on my own, but now I can more than 200 quarts of food a year. When we started going to Mother Earth News shows as a vendor I was not familiar with fermenting at all. In fact the idea of letting something ferment on my counter just sounded weird. 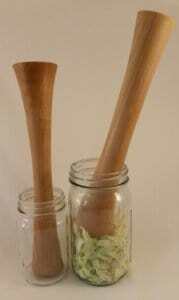 People kept asking if we sold vegetable tampers, so we did some research and developed a tamper. We asked fermenting expert Kirsten Shockey to give it a test run. She loved it! The more I heard about fermenting and researched the health benefits I was intrigued. Fermenting is the reason why we have such amazing foods in our homes. Wine, Cheese, leavened bread, yogurt, pickles….and the list goes on…. all these were first created with fermentation. People didn’t always have refrigerators, freezers or nifty canning jars so they found ways to extend food life with some tasty results. However, most of the processes that make these foods now do not include fermentation. So instead of getting those natural enzymes and probiotics from our food that generations before us got, we often get them from the pharmacy or simply not at all. 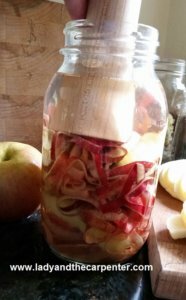 So, two years ago I made my own Apple Cider Vinegar. Super easy, LOVED it. I was amazed when this simple concoction turned into vinegar. Wow! I was truly shocked that this simple mixture became this beautiful Apple Cider Vinegar. 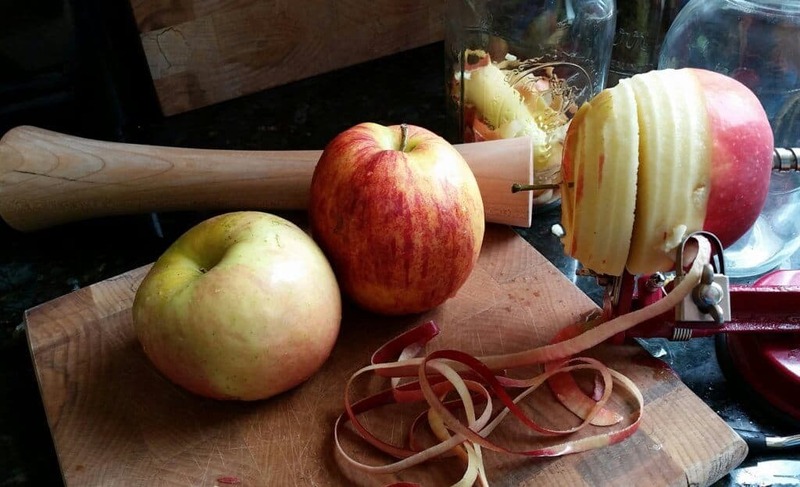 Plus, it was a great way to use some of the MANY apple peels we had in abundance. I used it in recipes and even better… The Carpenter, who has some gut issues, started drinking it and it did wonders. I wanted a good book to lead the way so I checked out a bunch of books from the library and found that a lot of them were just too much scientific jargon, not enough information, or not practical for small batch fermenting. 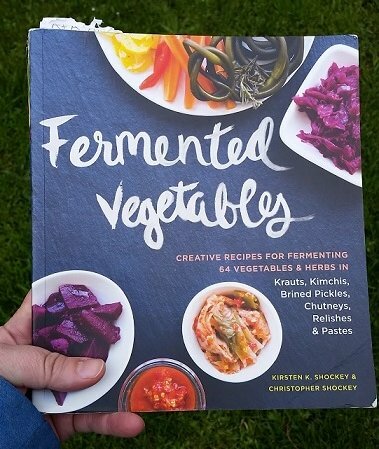 I kept coming back to Kirsten and Christopher Shockey’s Book Fermented Vegetables so I added it to our book collection. Granted, she helped test out our tamper, but I love the format of her book. It had information about the process so I understood the basic science. 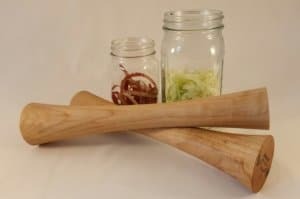 Fermenting Vegetables has basic instructions that are easy to follow, helps me troubleshoot, and even has a section to lead me to some more reliable resources. It also has LOADS of recipes so I could learn how to ferment and then know what to do with it when I was done. I would recommend this book to anyone starting their journey of fermenting. 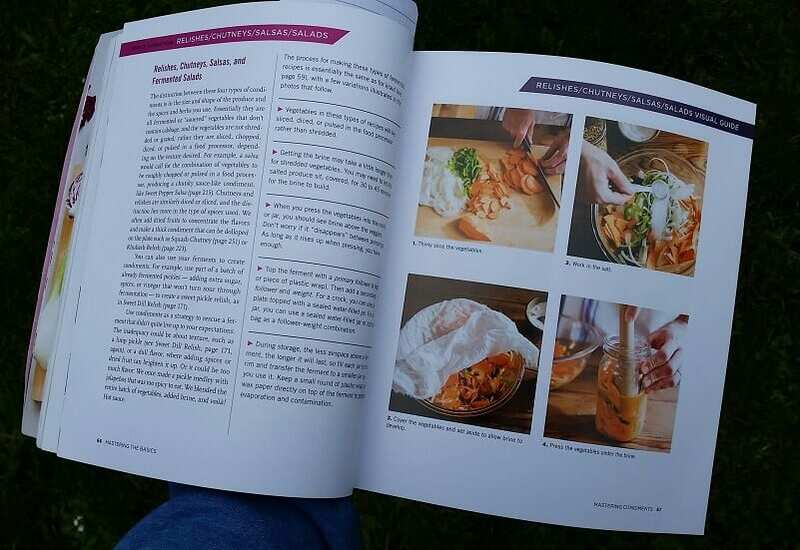 It has technique basics, then specific recipes for making ferments and to top it off there is a great section with recipes that give you ideas of what to do with that ferment when it is ready. Not super fancy recipes that are beyond what we would make, but ones I can see my family enjoying. I personally need some idea of what to do with these beautiful concoctions. Once I have a few ideas I can take it from there. So, on with my fermenting adventures! I have my beautiful Tamper in hand and I am ready to pound on some veggies (and some fruit in this case)! I will share an update in a couple weeks when my Apple Cider Vinegar is all fermented. Happy Fermenting! while the other end fits in those regular mouth jars.